Here’s a hypothetical scenario for you: The Cherry Blossom 10 Mile Run is happening on April 3, just 25 days away. Actually, I lied. This is not hypothetical for the Newbie right now, this is a scary-real scenario. The interwebs offer plenty of 10-weeks to a 5k/10k/15k programs…but we need the 3 ½ weeks version. Since I can’t find anything along those lines, looks like I’ll be creating one myself! The Challenge: Get ready for a 15k in 3 ½ weeks! 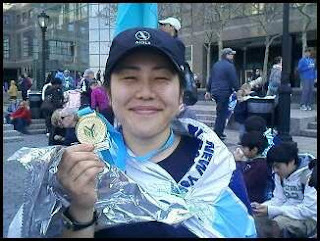 Exercise Background: Swam competitively through high school, ran NY Half Marathon 2010. Recently has been running on and off once or twice a week, no more than 4 miles. Cross Training: Probably not going to happen. The Goal: To finish Cherry Blossom in as little pain and misery as possible. 10. Long run: Run 6 miles, after 4 miles run/walk (2 minute run/1 minute walk) as necessary. The Results: TBD. I will keep you posted, and maybe the Newbie will be back with a post-race guest post!